At first glance, Lightmare Studio‘s Beware Planet Earth didn’t exactly make me jump at the prospect of yet-another-tower-defense-game, but a closer look revealed some interesting mechanics that was only made better by the cheesy 70’s sci-fi humor. Ask yourself this: When was the last time a game let you prevent aliens from abducting cows, by way of quirky inventions and weapons? Because I certainly don’t remember anything that crazy, which makes for a nice break from what we usually get within this genre, if nothing else! According to the developer, the full version contains 46 levels and.. achievements! That’s right: 25 of those, so if you’re into collecting virtual trophies there’s something to do even after beating the main game; on top of the 18 bonus challenges. 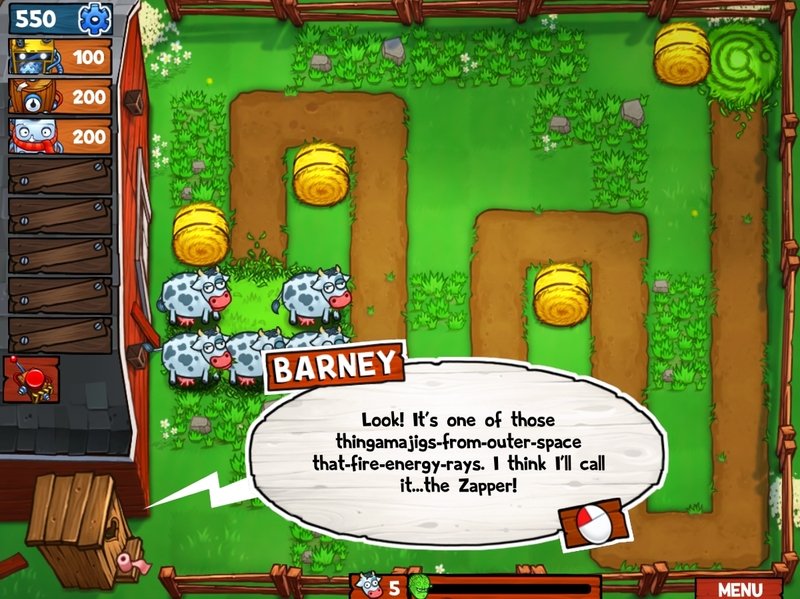 But of course the later part of the game would likely get a bit dull without some variety, and thankfully this game delivers: There are more than 20 Martian cow-nappers ranging from “odd” to “what? !” that you need to defend your farm animals against, and a whole bunch of (potentially) weirder machines built for that very purpose – there’s even one called the ‘Helicowpter’. On top of that, free DLC has been announced but since the game just came out there’s obviously no release date yet for that. Plus.. a talking outhouse. I kid you not. A talking outhouse. That’s either crazy, brilliant or both. There’s a demo on the game’s official website, where the full version can also be acquired for €9.99 (or the equivalent in your currency) and the developer can also be found on both Twitter and Facebook. Now go zap them aliens before they kidnap every last cow on the planet!